Christine Vaillancourt toured a model of a 300-square-foot micro-apartment at the Boston Society of Architects. Mayor Thomas M. Menino’s top planning aide said Tuesday that Boston is unlikely to allow large numbers of micro-apartments in the next few years, citing the need to protect living standards and ensure the units are reasonably priced. Chief planner Kairos Shen, an influential voice in city housing policy, said Boston has permitted construction of about 195 smaller units in the South Boston Innovation District. But he also noted that the first units to hit the market, some as small as 355 square feet, are commanding $1,700 a month or more. The city’s program in the ­Innovation District allows some units to be built below the current minimum of 450 square feet, but Shen said officials are not ready to expand it to other neighborhoods. He encountered pushback from micro-housing supporters Tuesday who argued that the higher rental costs are being driven by the city’s refusal to allow more of these compact units to be built. Developed in greater numbers at the right sizes, they argued, prices would be closer to $1,200 a month. With growing US cities looking to hold on to young professionals, city officials are experimenting with the construction of tiny­ dwelling units. 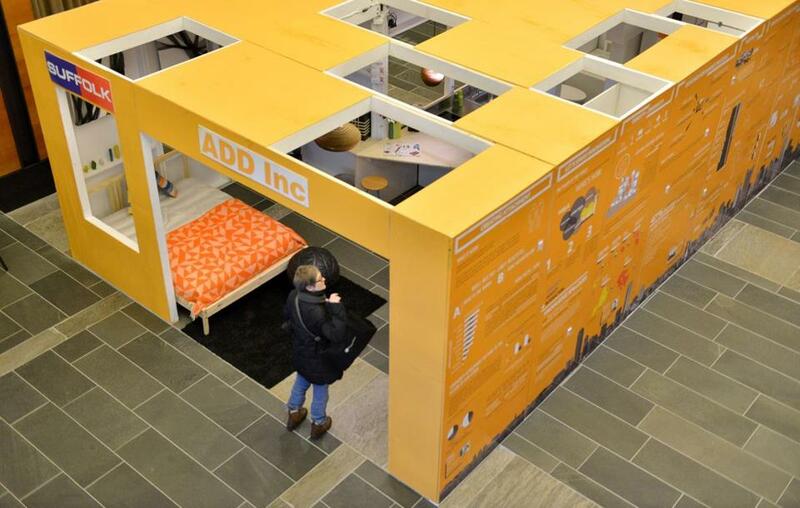 “If you take the unit sizes down to 300 square feet, suddenly it starts to look more approachable,” said Tamara Roy, an architect with the firm ADD Inc., which has become a chief advocate of micro-apartments. The firm has designed dozens of compact units under development at Pier 4, 399 Congress St., and 319 A Street in the Innovation District. 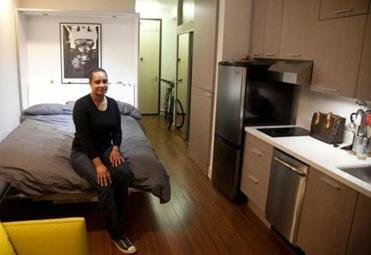 Cities from San Francisco to Seattle to New York are exploring construction of apartments as small as 220 square feet to provide more housing for young professionals who are flocking to cities for jobs and the conveniences of urban living. These units are significantly smaller than traditional studios, but they also reduce the high price of being downtown. To help moderate housing costs, Menino announced a plan on Monday to build 30,000 new units by 2020, saying Boston must accelerate production to accommodate young professionals as well as seniors and middle- and low-income families. During Tuesday’s forum, an executive with Vertex Pharmaceuticals Inc. said construction of more compact, lower-cost housing will help the company attract and retain skilled young scientists near its new headquarters on the waterfront. The company, which employs about 2,000 people, is moving to an $800 million office complex under construction at Fan Pier in the Innovation District. Shen said the city is working with the Rappaport Institute at Harvard University to study the economic effects of allowing smaller apartments in the Innovation District. In addition to the effects on the housing market, the study will examine whether these units help to fuel more collaboration and entrepreneurial activity among residents. Roy said, however, that the city is already facing a critical shortage of housing for young professionals as well as middle-class families. She believes that the city’s prescribed units sizes should be reduced in all categories — allowing studios to be as small as 300 square feet and two- and three-bedroom apartments to be 700 to 850 square feet.